Have you visited the GameDayDivas.com Web site yet? If you have not, you’re missing out on the cutest and most fashionable fashion and accessories to wear to any Clemson event. Game Day Divas offers a multitude of fun and funky Clemson items that you can shop for online without actually being in Clemson. 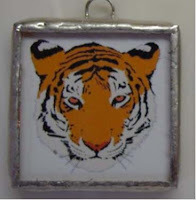 Their products are not only great for looking your best on game day, but also make great gifts for other Clemson fans. And, when you shop with Game Day Divas, you’re shopping from Clemson alums that live and raise their families in Clemson. Best friends, Tommi and Lynn created GameDayDivas.com in 2008 as a spin-off company from TigerTownTots.com. Tiger Town Tots was originally created in 2006 to offer little girls adorable custom designed ribbon jeans since they each have a little “Diva”. 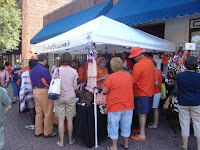 They had an immediate demand for the Clemson Tiger ribbon jeans. Soon after they were creating crystal embellished shirts and monogrammed headbands. It did not take long before the "big" girls started requesting specific items for themselves. Tommi graduated from Clemson University in Civil Engineering BS '92 and MS '95, and she has been with Clemson University since 2006 serving as a Project Manager and now is the current Energy Manager. Lynn also attended Clemson University, but went on to receive her Business Administration BS '08 from Southern Wesleyan. She has attended Clemson football and basketball games for over 30 years, is an IPTAY supporter, and has worked at Clemson University since 1990. Tommi & Lynn quickly realized that a new website, http://www.gamedaydivas.com/, was needed to offer game day apparel and accessories to their divas! Since Tommi and Lynn are Clemson fans and supporters, a large portion of their product line is focused around Clemson Tiger game day apparel and accessories - orange, purple, and white. However, as new customers made requests, the product line and colors have expanded. Here is a sneak peek into some of the cute and funky products Game Day Divas has to offer. Game Day Jewelry – Game Day Divas offers a variety of Diva Jewels – unique, Clemson-themed charms that you can purchase to mix and match for customized bracelets or necklaces. Tailgate Accessories - I love this adorable bucket – perfect for tailgates. Pack with ice and a few beers (or sodas or water) and sit out on your tailgate table. The monogrammed koozies are so cute. I’m planning on buying a few for my friends for Christmas presents. Use less waste and ‘Go Green’ by toting your tailgate munchies in this orange carrying basket instead of using plastic bags. And finally, check out Game Day Divas reusable, tailgating cups – 8 cups for only $9.95! 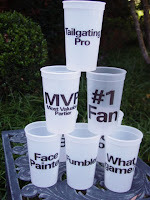 Each member of your tailgate crew gets their own personalized cup…my pick is MVP…most valuable partier! 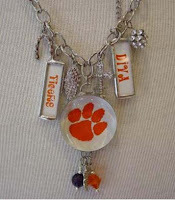 Game Day Apparel – Game Day Divas also offers some super chic Clemson game day outfits and accessories. Anyone can wear this Clemson Landmark shirt – it’s 100% cotton and is delicately embellished with rhinestone crystals. 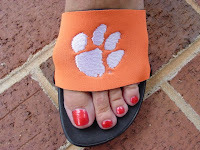 They also offer these cute (and comfy) Clemson one-sole flip flops – you keep the sole and change out the topper. And I will definitely be buying the orange pashmina – these are great for the October games when the sun goes down and it gets brisk, but they also work well as scarves in November. Love it! If you have a daughter, sister, cousin, etc. who goes to Clemson, the orange pashmina is a must gift! Game Day Diva Handbags – The site also has a variety of purses that will match any orange and purple game day outfit. I’m totally in love with this orange and white purse pictured below. Tommi and Lynn told me this purse was a huge hit at Dabo’s Ladies Clinic last month …these are sure to sell out FAST! 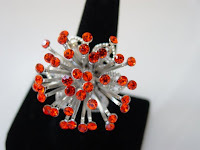 If you are looking for super chic orange apparel, purses or accessories, you must check out at GameDayDivas.com. During all home football games this fall, you can find (and shop!) the Game Day Divas tent in front of Tiger Town Tavern, http://www.tigertowntavern.com/ on College Avenue, Clemson, SC. Tommi’s husband owns Tiger Town and is thrilled to support the Divas! Specific requests and questions can be emailed to Game Day Divas at custserv@gamedaydivas.com! Also, Tommi & Lynn encourage every Diva to register online. They intend to send out special promotional coupons each month for online customers. Their goal is to dress every diva for gameday!